Whether you’re a client looking for marketing services, or an agency pitching your wares, the question of who’s really calling the shots can be a pivotal one. On the one hand, the organisational perspective might be that marketing teams are evaluated on and are seeking things like improved performance, chemistry harmony between teams and agencies, creative brilliance and / or strategic smarts. On the other, client procurement teams are likely going to be evaluated on things like cost based efficiencies, savings, synergies and risk mitigation. And with those perspectives, it’s hardly any wonder marketing and procurement teams can find themselves at odds with each other, leaving potential agency partners a little bewildered as to who’s really calling the shots. Read more here. Ad agencies view procurement’s growing power with horror. Procurement is the acknowledged enemy. This short-sighted view of procurement may doom agencies to further attacks. What agencies (as suppliers) have ignored is procurement’s historical mission and success as an engine for positive change that focuses on “quality improvements,” not just cost-reduction. Procurement drove the “lean production” innovations that allowed the U.S. automotive business to compete successfully with the Japanese car companies after 1980. Procurement led the advances in supply chain innovations that saw the empowerment, rather than the enfeeblement, of suppliers. Read more here. What are the similarities between refrigeration and marketing procurement? In this episode of the Managing Marketing podcast, Steve Lightfoot, who at the time was Senior Manager, Global Procurement at the World Federation of Advertisers, discusses with Darren the challenges faced by global procurement teams and the role they will increasingly play in risk management, and assisting global marketers in dealing with the huge complexity and differences of the global market on a market-by-market basis. Read more here. Get you free procurement downloads here including: Marketing Procurement Health Check The TrinityP3 ‘Marketing Procurement Health Check’ is designed to allow you to chart your marketing procurement capabilities. Television Advertising Production Governance Guide The TrinityP3 ‘Television Advertising Production Governance Guide’ allows advertisers and their procurement teams quickly and conveniently to identify the areas of risk to good governance and due diligence in your television advertising production process. 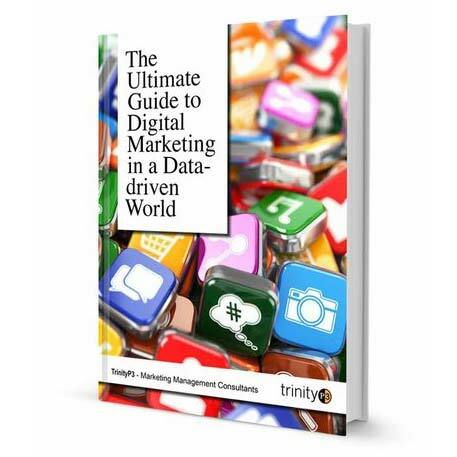 The Ultimate Guide to Digital Marketing in a Data-Driven World TrinityP3 is proud to share The Ultimate Guide to Digital Marketing in a Data-Driven World. This definitive guide has over 27,000 words featuring insights, tips, observations, tools, platforms, strategies and much more. “The posts by Darren Woolley and the TrinityP3 team are critical insight. First of all, they provide a glimpse from a unique place in the world — Asia – and yet are truly universal. The collection of top posts gives professionals in our industry fantastic “food for thought” as we go about our hectic lives. He and the team are truly well respected experts and their intelligence is world class”. “Trinity P3’s Top 50 Marketing Management Posts is a wonderful collection of well-written, insightful blog posts by Darren, his team, and guest writers. They deal head-on with some of the most timely and on point challenges in the industry. Whether you’re a client leader, an agency leader, or industry consultant, this book is a “must read”. Find out what they are talking about here. Or buy the latest copy here.